The first project of CPAZ is helping children attend school. Education in China is free until 12th grade in schools under the juridiction of the government. These schools are the equivalent of our public schools, whereas "private schools" are here considered as public (non-governmental). Governmental schools welcome all registered children, whereas private schools are for children coming from a wealthy family (because the tuition is expensive) or non-registered children. Like in any other country, you must declare your child after birth. However, the one-child-policy only allows to have one child. It is illegal to have more children, otherwise one must pay an expensive fee that most people can't afford. Today, the country's population is of 1,3 billion. Add an estimated 200,000,000 non-registered people. Besides, even though tuitions are free, a child still needs to pay for the schoolbus, books, uniform and meals. Here in Zhuhai, these fees represent 550RMB/semester. The issue at the origin of CPAZ's creation is access to education for every child. In Zhuhai, we estimated that 2,000 children don't go to school for several reasons. Nowadays, after years of effort, we manage half of the problem. This is how we envision the importance of universal education: we see access to primary education as the fundamental requirement of a functionning society. Not only does education ease access to a job, children also receive knowledge about hygiene, their rights, and to be aware of the country and world they are living in. Studying at a school also develops social skills, indispensable for a balanced life in our society. Most of the children we help live in poor and uneducated families. Having the possibility to learn, they become their family's little prodigy. They teach their parents, grand parents, sisters and brothers, leveling up their family. - Tuition fees: Each semester's expenses represent 550RMB. We use the money from donations to pay the tuition of the children we take care of. 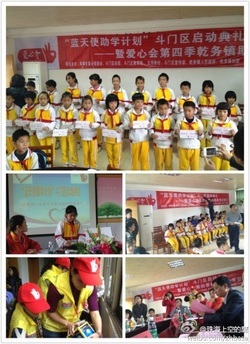 - Material (uniform, schoolbag...): When receiving their envelope of 550RMB, our proteges also receive a schoolbag, a uniform and schooltools (for example, a mini-globe). Some of our donors also donate books or other school items. How can a child receive our help ? We established a standardized procedure. We either look for the children in need, or receive them at our office. When we determined that the child is indeed in need, the child and the legal tutors must fill an official form. Depending on the case, we chose among our partner schools a place for the child, or send him/her to one of the schools we built. We are perfectly aware that these children often lack concentration or have behavioral problems. Nonetheless, we ask them to be active students during their studies in order to merit their 550RMB envelope. However, most of them are hardworkers and more than happy to finally learn.